Bulleid's 'Leader' Class 0-6-0 + 0-6-0, an Enterprise too far ? 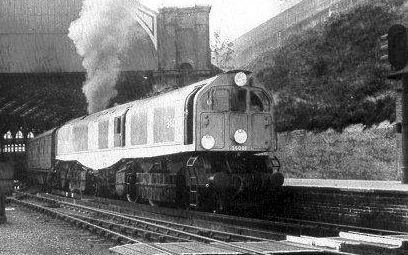 Photograph of prototype 'Leader' being shunted in 1949. Copyright of Mike Morant Collection, used with permission. 'Leader', the project that should have been the pinnacle of Bulleid's career; bringing together years of innovative railway design to produce a new breed of versatile steam locomotive. Towards the end of Bulleid's time as C.M.E. on the Southern, with Railway Nationalisation looming, came his boldest design yet. Earlier in his career Bulleid had forseen the future need for locomotive power, and wanted to give steam the opportunity to compete with diesel power on an equal footing. This meant a locomotive must be capable of greater distances between taking on fuel and water, reduced daily maintenance, and allowing the driver to work from either end - for better visibility, and to reduce the need to turn the loco. However, the result of all this amazing mechanical wonderment was hidden away in a large boxy structure that looked rather like a diesel ! With an outline sanction for 35 units, permission was granted to build 5 locomotives, construction commencing at Brighton amid a fair amount of secrecy and haste. With Nationalisation close approaching Bulleid wanted the project sufficiently advanced so that it would be allowed to continue. The design of Leader embodied elements featured in his previous designs, plus a few more. Welding was used throughout, the bogies were supported on 4 radial pads as CC1, and body panels were similar to CC1. The large boiler was a modified version of the very successful pacific boiler, but now fully welded in steel. The BFB driving wheels were 5' 1" diameter, the same as the Q1 class. The two self-contained 3 cylinder power bogies would allow the locomotive to compete with the acceleration of more modern electric units, and thus reduce delays in the timetable between trains. To reduce the time the driver and fireman spent in preparing the locomotive, the entire bogie running gear was once again encased in an oil bath; and the internal smokebox had a bottom chute for quick discharge. The twin bogies included fabricated cylinder blocks, and the sealed oil bath enclosing the modified Walshaert's gear featured external covers for the leaf springs, and the chain drives linking the centre to outer axles (one each side). The compact design was however complicated by the adoption of oscillating sleeve valves. 'Leader' was 67 feet long overall with a designed weight of 120 tons, contrasting favourably with the 69ft 7¾" length of a Merchant Navy class, at nearly 143 tons. However, because the boiler was offset from centre to allow a corridor from each end to the central firemans compartment, many extra tons of balancing ballast was later added, detrimentally increasing the overall weight of the locomotive. Commencing steam trials in June 1949, it was found that the fireman's compartment was unbearably hot, though probably not much hotter than a cab of any large steam locomotive in the summer, but the original design had envisaged adopting oil firing in the long run. Plus there was poor insulation between the (internal) smokebox door and the 'A' end cab, causing that driving compartment to be uncomfortably hot. As a result, the crew were only prepared to drive from this end for short distances, requiring the locomotive to be turned regularly, and explains why in many photos the central front window and doors are often open. Also the outer body panels had to be removed if wanting to examine or repair any boiler parts. Even filling with water proved difficult as the water filler point was higher than most station water crane hoses could reach. No doubt these problems would have been resolved in production locos. During running some serious problems surfaced, the worst being a persistent problem with the breaking of sleeve valves on Number 1 bogie, causing failure and requiring a tow back to the workshop many times. In addition, 36001 broke a crank axle after hauling a test train, and firebricks kept collapsing, so it was not long before this came to the notice of Waterloo. A lot more effort and money was poured into overcoming the issues with '36001', though by this time Bulleid had left for Ireland. A complete overhaul of the piston rings and sleeve valves on the power bogies was undertaken, then reported to be running better than ever before. On its final outing on 2nd November 1950, 36001 really performed well - 15 coaches hauled comfortably at an average speed of 50 mph uphill. Then returning light engine, reached 90 mph near Winchester, and the loco rode as smoothly as a passenger coach. But it was too late, the decision had already been taken to end the project. 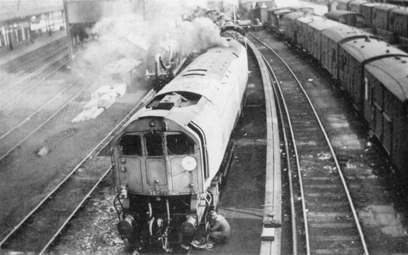 Sister locomotive 36002 was just two days work from complete when the order was given to stop work. This was certainly a crime considering the investment already made, and she may have proved more successful than 36001, which was continually modified during construction. 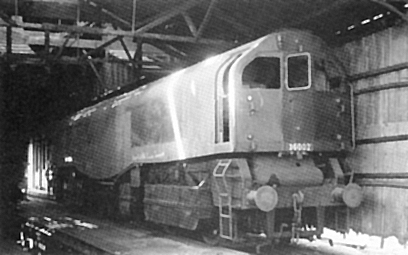 36003 was considerably less finished in appearance, but still a substantial rolling chassis with boiler, when towed away to be cut up. So, sadly, there is no preserved 'Leader'; once the project became an embarrassment Management were very quick to ensure the prototype and the 2 part built locos were cut up. By not keeping the prototype, future generations have been denied the opportunity to fully appreciate this radical design; how often this has been the way with other halted projects. Bulleid's vision was good, and perhaps if he had kept it simpler, implemented oil firing, and been able to build it without rushing, 'Leader' may well have resulted in a worthy locomotive that would have kept the Southern Region at the front of loco design until the end of steam on British Railways. But on this point we will have to continue to speculate . . . Notably, since writing this article, Kevin Robertson released an updated publication 'The Leader Project - Fiasco or Triumph', a brilliant and detailed illustrated history of this unique class. We can however get an idea of how well '36001' should have performed, thanks to the amazing 5" gauge 'Leader' built by Kevan Ayling.